So… We are doing things a little different. Your verses to study are within this post. Why don’t you send us some Word that has helped you during this season! So this word may be a little painful, because it may cause us to learn some hard truths about ourselves, but it has been my experience that I grow most in moments like this. Before we dive in, do me a favor and look up the definition of the word “lamentation.” As you can probably guess by now, this post is going to deal with our sorrow and pain. It’s not the kind of sorrow we experience when our favorite boy band breaks up, or when Starbucks stops serving pumpkin spice lattes, but the kind of sorrow that runs deep. It’s the sorrow that lasts and has to be dealt with or the result is an ugly scar. Lamentations is a book written to express the immense suffering the city of Jerusalem was experiencing due to its own sin. Basically, the city got itself into this situation by ignoring God’s will. Have you ever been there? I know that I have. I know I’ve done things my way to try to make myself happy, but end up broken, and that’s hard. So, let’s talk about how this makes us feel and how to deal with the consequences of our sin when we feel isolated, ashamed, empty, and forgotten about. Read Lamentations 1:1-2 and 2:15-16. I used the ESV version, but you do you. These verses set up the scene for us. The City of Jerusalem was once a “princess among the provinces” and is now a slave. We know that Christ has made us royal and that we are a light among the dark world, but sometimes we can quickly enslave ourselves. We choose to run back to the chains our Savior has freed us from. It is in these moments that the enemy whispers in our ear and says “Wow, you’re not royalty. You’re not forgiven. You’re not covered by the blood of Christ.” I am here to tell you that that is a lie. Christ’s love for you surpasses all circumstances, and let me tell you a little secret… the sin you find yourself in isn’t new news to God. He knew about all your past, present, and future sins while His perfect son was paying for it. In verse 2, it says that “among all her lovers she has none to comfort her.” What “lover” or sin has promised you the world and left you alone? See sin has the tendency to disguise itself as a “lover” or something desirable or something that brings joy, but that is also a lie. It only breeds emptiness, and when it is unable to fulfill whatever it promised to you, that unfaithful lover will only bring you sorrow. Sometimes its not the enemy attacking through our thoughts, but through other people. Verse 15 says that people who pass the city say “‘is this the city that was called the perfection of beauty, the joy of all the earth?’” You see, people who do not have Christ get reassurance and gratification out of our failures because it makes them believe that there’s nothing different about us and that allows them to not have to face their emptiness. You should know this; no matter what you are going through, if you have the Spirit living in your heart you are beautiful and perfect in the eyes of our Father. A common mistake is that people tend to believe that because we are saved we shouldn’t mess up. We are all in a process and THAT lie is EXACTLY the sort of lie that makes us give up that process. Satan is good that way, but our God is greater and continues to pursue us relentlessly. So in all this emptiness and loneliness and shame where is our hope? Our hope rests in Christ and his finished work on the cross. You may have been going back to your chains, but God’s mercy never ends and is new every morning. That’s a big deal guys! His love for us never ends and He is faithful unlike the failing promises this world makes to us. So rest your soul and let the Lord be your portion. If He is your portion, then He is enough and sin becomes less and less tempting. If we focus on His love for us we can do nothing but hope in Him. Let Him mold your heart to look like His and rescue you from this lonesome state. Remember, He isn’t angry with you… His anger subsided on the cross. His heart breaks for you, however, because He loves you deeply. Live the flourishing life He desires for you and He promises you will have everlasting joy. I encourage you to listen to Brokeness Aside by All Sons and Daughters after reading this. I truly believe it emcompasses exactly what God has layed on my heart. What definition of “lamentation” did you find? Which definition do you identify with the most? Is there a particular sin that you don’t think God is big enough to forgive you of? Try writing out every lie from the enemy. Then we would like you to rip it up and believe what your Father actually says about you. Have you ever experienced a time when you thought something would make you happy? Did it make you happy or hungry for more? Share with us some verses that have uplifted you during your time of lamentations, maybe some songs that reminded you of the Lord’s love for you. Next > The Lion of Judah Roars in Me. Beautiful reminder. I needed this today. 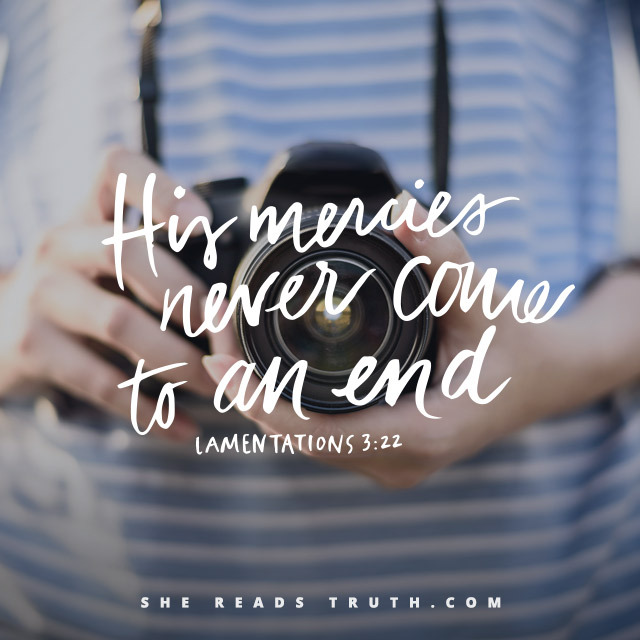 Lamentations 3 has been one of my life’s go-to Scriptures, and it was good to remember. Nights don’t last forever, and joy comes with the morning. OOOOHHH!!! That’s a good one! Keep them coming, Diana!